Every family should be prepared for disaster. Earthquake, tsunami, hurricane, tornado, flooding, or car crash in a remote location can all result in the need to be self reliant for a few days. Will you trust that rescue personal will get to you in the aftermath of a disaster? Others might be worse off than you are and may be prioritized over you. Maybe no one knows to come looking for you? What than? It is critical that every family have an emergency survival kit on hand and that every family member know where to find the kit instantly. The more portable the kit is, the better, in case you need to flee your home on foot or by car. For this reason a backpack kit is ideal because it is easy to carry and contains all the emergency essentials nicely. Shelter and Warmth: We can skip a few meals and not be too bad off, but life gets pretty rough when you are cold and exposed. Mylar emergency blankets are a good lightweight solution because they capture and contain body heat. Mylar emergency sleeping bags are even better. Basic Tools: Some multi-purpose tools will help in an uncertian disaster situation. A portable cooking stove makes a huge difference between cold uncooked meals and a nice warm dinner. Make sure you have fuel for the stove too. Some stainless steel cutlery is always useful, not just for eating, but for preparing wild food, making holes in things, acting as a impromptu screwdriver, and any multitude of uses. Throw in a steel cup for drinking, boiling liquids in, mixing medicine in or just holding small items. Preventing injury to your hands is critical to your comfort so a good quality pair of work gloves will come in handy for dealing with the mess of a disaster. A few garbage bags (make good temporary shelters from rain) and heavy duty ziplock bags will find many uses as well. First Aid, Hygiene and Sanitation: When you aren't sure how long you will be without power or utilities, the simple act of freshening up can boost morale. It also helps keep everyone healthy. Include some tissue packages and individually packaged alcohol wipes along with a small first aid kit. This will come in handy even if there is no disaster, but someone is hurt in the house or car. A couple fresh toothbrushes and a tube of toothpaste is another nice addition. Don't forget some toilet paper rolls since they never spoil. Comfort and Communication: A flashlight and flares are great communication devices. Leave the batteries out of the flashlight because they will last longer in storage. Stuck away from help can be nerve racking, so a little entertainment is always welcome. A deck of standard playing cards, a kid's book, a rubiks cube or other little game, a note pad, and a golf pencil are all worth having around. Throw in a sharpie marker for good measure because you may want to write on your home or car where to look for the family. Pet owners may want to add pet photo id cards. A selection of food supplies that are easy to make and have a long-term shelf life round out the emergency kit. You should pick foods that you and your family will enjoy eating, especially focused on familiar foods. During a disaster is not the time to find out if you enjoy curry or not. If you eat rice all the time, make sure your kit includes rice. If you are more a meat and potatoes family, buy accordingly. 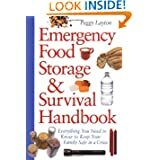 Here is an example list of meals from one pre-made emergency kit. These products have a 7 year shelf life, so every 5-7 years, just eat the meals up and replace them with fresh stock. You should also test several pouches for actual meals to see if your idea of a serving matches the manufacturers idea of a serving. We've found that we like to eat 2 or 3 "suggested servings" to create a filling meal. If you are planning for 2 weeks of emergency food you need to adjust the serving sizes to match realistic servings. Food included in a "Long Term Food Storage Essentials Kit"
28 Lunch/Dinner Servings of "Cook in the Pouch Meals"
Brown Sugar Oatmeal - 4 Servings (1 Pouch) 24 oz. 2 Mylar Emergency Sleeping Bags, Portable Cooking Stove (includes 16 Fuel Tablets), Steel Fork, Knife, & Spoon Chow Kit, 16 oz Steel Cup, Pair of Leather Palm Work Gloves, 2 Infectious Waste Bags, 6 Packs of Pocket Tissues, 36 Piece Pocket First Aid (Bandage) Kit, Deck of Standard Playing Cards, Note Pad, Golf Pencil, water filtration bottle capable of removing 99.99% of all pollutants from 100 gallons of water, Dyanmo 4-in-1 Radio flashlight, and waterproof matches. Make your Own Kit or Buy a Kit? It can be a fun project to build your own emergency survival kit, and a bit of a scavenger hunt. You likely don't have a water filtration bottle and may not have a portable cook stove. The long-term food can be bought at an outdoor store or off Amazon easily enough and you can mix and match to get foods your family likes. A premade emergency kit may be cheaper then buying all the pieces individually and takes no effort to put together. If you are short of time and just want the piece of mind that comes with being prepared, than just go with an appropriate sized predesigned emergency kit. Remember that a 2 week kit may be only designed for 2 persons - not enough if you have a family. You can add on extra food and personal supplies to the premade kit though to accommodate a larger family. 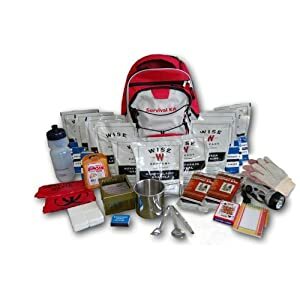 Definitely emergency survival kits are a great gift for loved ones. Everyone needs an emergency kit at home and in the car. Good for the cabin or boat as well. Timely article with 2012 and the end of the world coming. (Sarcasm) I'm not a believer. On a more serious note this article is well timed with the advance in numbers for tornadoes within the United States. Many communities have been completely destroyed in the past few years alone and the numbers continue to rise every year. Whether this is a trend or an ironic coincidence your article makes great sense and could save a life or two in extreme situations. Rock on thumbs up from me all the way.